We had the pleasure today to take a little journey to Sanchon 산촌, a fairly famous restaurant in Insa-dong. It’s the place known for Buddhist temple cuisine. Remember a while back I did an article about temple cuisine? Okay, well, this is one of the few times that I would say vegetarian food is good. GOOD! Sanchon is a bit pricey, so it’s a special occasion place. And it truly surprises. The food uses no animal products whatsoever. It’s not only vegetarian, it’s freakin’ VEGAN! The difference between this vegan food and the vegan food you’d get in California is that this actually has flavor. The ladies there gave me a special honor in letting Eun Jeong and me into the kitchen to watch how they make some of the dishes, specifically the namul 나물. This is the category for small veggies. 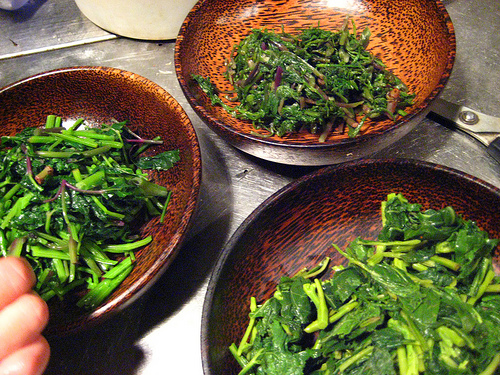 Here’s a little recipe for watercress, which is in the top bowl in the picture. Add each ingredient and mix one-by-one with the watercress. Serve in a wooden bowl. Since I did that article on temple cuisine a while back, I noticed that they were breaking a few rules there, particularly in using garlic, gochujang and refined sugar. Those are no-nos in traditional Buddhist cuisine. We asked about it and got the reply that occasionally the use of those ingredients is okay in moderation. I remember asking the Buddhist monk who lectured us on temple cuisine about using garlic, and he said it was okay, too, in special circumstances, like when a monk has low energy or some type of illness. They modified their claims by saying that one could request their meal be totally free of the verboten passion-inducing ingredients. Nonetheless, this is a well-balanced dressing for any peppery greens. It would work on arugula, too (for all you Obama supporters). I asked the same thing. They said that they bend the rules a little bit, but upon request, they can take the garlic and onion out.